Last summer, the Design Exchange and Nespresso partnered on a competition called Grand Cru/ation that challenged designers to rethink the conventional coffee break. Lilly Otasevic’s winning proposal, called Break~Wave, was manufactured and installed on November 11 in Toronto’s Union Station as part of the DX’s Satellite program. 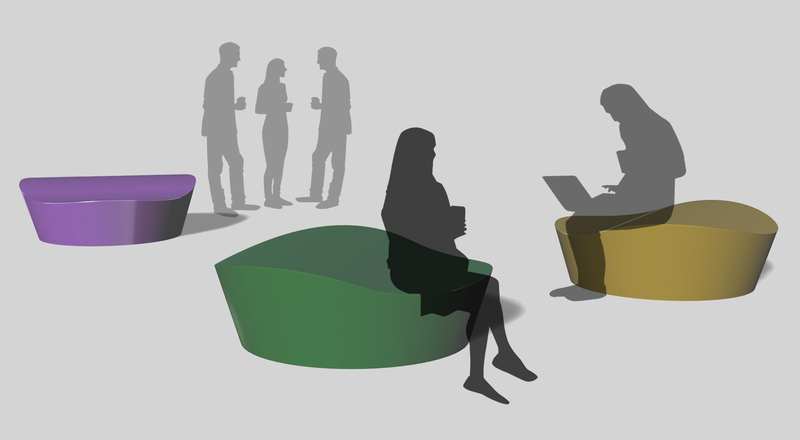 Break~Wave was designed as a low-lying round bench topped with an undulating surface that mimics the organic properties of coffee. Pieces of aluminum for Break~Wave are buffed for assembly by builders at Toronto-based GG Fabrication Inc.
Entrants were challenged to submit proposals for an aluminum structure to encourage the recycling of Nespresso capsules, which are also made of recyclable aluminum. Manufactured in three colourways, representing the Nespresso Grands Crus: Linizio, Arpeggio and Odacio, the benches are now on display at Union Station in the newly renovated West Wing.